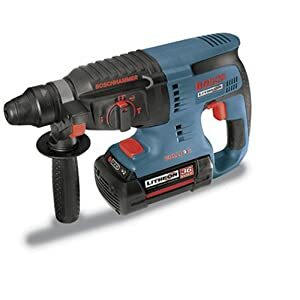 I've got a Bosch GBH 36 V-LI Professional (similar to the one above, I haven't looked to see what the difference is) and know two other people who have them (they've had no complaints). The drill is super powerful and batteries are good. See also: Drills comparison thread. Tx Pierre. Depending on use I would probably recommend smaller drill (especially if you are going to remote places... you know Yellowwood or TM - I generally don't go far with mine as most of the bolting I do is in Montagu. The rock here is also really hard, so having more power is nice. I've got the Bosch GBH V-36 LI (i.e. the 2.8kg baby) and am really happy with my purchase. The smaller drill has a lower impact force, so drills slower. I've read somewhere that you'll still get the same number of holes per battery as with the big daddy. I have the bigger one that Justin uses. It was used mainly for drilling the 12mm holes required for the glue ins of the ARF (About 20 routes I think), but also for about 25 routes using 10mm express anchors. I started with the smaller Hilti, which was fine for 10mm holes, but could not manage the 12mm stuff adequately. One other point that I found was that the higher the impact force the lighter the drill is on drill bits. This was due to the fact that there appears to be less work done by the turning action hence the drill bit does not get blunt so quickly. I have drilled hundreds of holes with this Big Rock Muncher and will certainly replace it with the same if this one eventually fails. It is also much faster on holes than the smaller Hilti (I think it was called a TE2a). I have unfortunately never tried the smaller Bosch. What are the two impact forces compared to each other, because that tells quite a story on its own? 1.8J for the Compact Professional vs 3.0J for the Professional. If I am not mistaken that is more or less the same as the TE2A so for 10mm holes it will in all likelyhood be OK, but will battle with 12mm holes and you are like to replace drill bits more often than with the big boy. That being said, I've had no problems with 12mm holes in limestone. Haven't experimented with other drills or rock types to comment definitively. Some of the sandstones (Piers Cave for argument sake) are very hard and that is where your drill will battle with 12mm holes. IMHO unless you are planning to do big wall routes in very remote places with long walk-ins you will be better off with the heavier drill. Q: What drill bits are you guys using? I moved from away the Fischer Rotary Hammer Bits (pictured on the right) and started using the Hilti TE-CX Hammer drill bit (pictured on the left). I've found them to last twice as long +- 20 holes when drilling into Montagu rock. The Hilti bit TE-CX bit is +-R190 a piece (about double the price of the normal bits). Ruwag - cheapest ones from builder's warehouse. Tx Pierre, I've tried cheap drill bits from Build It, but they don't last more than 3 or 4 holes. I'm sure your rock up north is a softer than the quartzitic sandstone that I am drilling into. What happens to me with cheaper bits (this applies to all bits over time), after 3 or 4 holes have been drilled, the bit becomes worn and the diameter of the hole becomes less (you still have a perfect hole) but the hole diameter is too small for the bolt and you then have to beat the hell out of the bolt to get it it (which is not good for the bolt & results in not being able to remove the nut afterwards). A blunt bit also makes your drill work a lot harder and uses up more battery. So from my point of view its better to buy an expensive bit and not have to change it as often. If you were big walling and weight were an issue I would recommend the Hilti bits that I have mentioned above. Last edited by Marshall1 on Thu Mar 31, 2016 8:50 pm, edited 1 time in total. I understand the beating the bolt thing. So since you have the really ridiculously price bit already, here's a plan. Buy some cheapies and if you find the holes aren't good any longer just use the Hilti bit to resize and that way it should last a long time. I must say I wouldn't want to be up there juggling bit while drilling. PS I'm still drilling with a Riobi petrol drill. If you can handle the weight nothing beats it. Marshall, may I buy a few bits from you please! Very keen to try them out. Tx Garvin, I have been doing that. Bosch Blue Granite bits (but I'm not sure whether they're available in SA, and my limestone is probably softer than your quartzite). Thanks Derek, sent you a mail. For what it's worth I also went the cheap bit route. Tried the Multitip bits, but found them to be prohibitive in terms of cost per hole. I am currently reviewing a handful of drills for SA mountain mag, and trying out some of the bits. The results will be published in the September issue but if you can't wait and want to buy a drill now, email me. Marshall1 wrote: I pay R14.60/bit plus VAT(thats on bulk 200 x 110mm 10mm). Get 8-12 holes per bit. No name brand. Not sure on quality or anything but looking at the price of that Bosch posted above, this looks like a steal! check the specs, make sure it's an SDS drill. Also, beware of batteries - that thing looks pretty old, the batteries may be shot and replacements, if available, will be expensive. How badly do we get screwed!